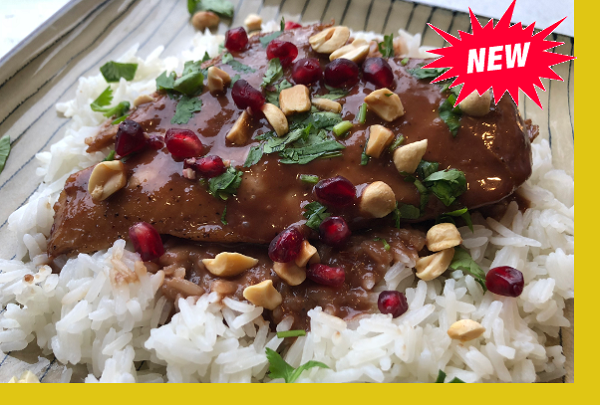 Delicious chicken breasts seasoned and quickly pan sauteed then immersed in a flavor packed pomegranate coconut sauce. Served over rice. Simple, delicious and full of healthy (pomegranate juice) antioxidants! Coat a pan with oil and heat on medium high heat. Cook chicken 3-4 minutes per side. Remove to plate. Heat pomegranate sauce and simmer until thickened to desired consistency. Add chicken back and spoon sauce over chicken. 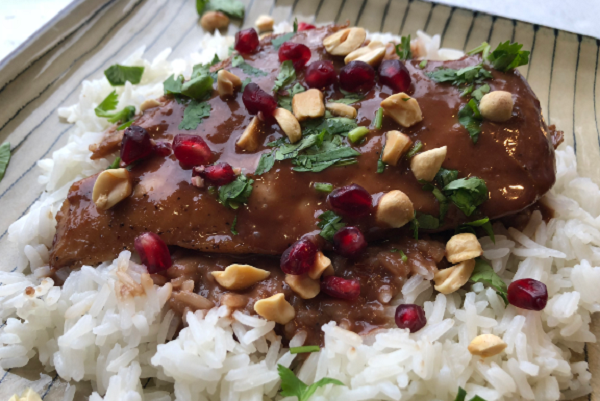 Garnish with peanuts and cilantro and serve over rice. This dish was delicious. High end restaurant quality. The pomegranate coconut sauce was so good. Sticky rice and peanut / cilantro topppings, perfect combination. The chicken was very well seasoned. We will look for this again!